The Chicago Tylenol Murders were a series of poisoning deaths resulting from drug tampering in the Chicago metropolitan area in 1982. The victims had all taken Tylenol-branded acetaminophen capsules that had been laced with potassium cyanide. [ A total of seven people died in the original poisonings, with several more deaths in subsequent copycat crimes. On September 29, 1982, twelve-year-old Mary Kellerman of Elk Grove Village, Illinois, died after taking a capsule of Extra-Strength Tylenol. Adam Janus of Arlington Heights, Illinois, died in the hospital later that day after ingesting Tylenol; his brother Stanley and sister-in-law Theresa, of Lisle, Illinois, later also died after taking Tylenol from the same bottle. Within the next few days, Mary McFarland of Elmhurst, Illinois, Paula Prince of Chicago, and Mary Reiner of Winfield all died in similar incidents. Once it was realized that all these people had recently taken Tylenol, tests were carried out which showed cyanide present in the bottles from which the victims had taken the Tylenol. Warnings were issued via the media, and patrols using loudspeakers warned residents throughout the Chicago metropolitan area to discontinue use of Tylenol products. Police, knowing that various sources of Tylenol were tampered with, ruled out manufacturers, as the tampered-with bottles came from different pharmaceutical companies—and the seven deaths had all occurred in the Chicago area, so sabotage during production was ruled out. Instead, police concluded that they were likely looking for a culprit who was believed to have acquired bottles of Tylenol from various retail outlets. Furthermore, they concluded the source was most likely supermarkets and drug stores, over a period of several weeks, with the culprit likely adding the cyanide to the capsules, then methodically returning to the stores to place the bottles back on the shelves. In addition to the five bottles that led to the victims’ deaths, three other tampered-with bottles were later discovered. In a concerted effort to reassure the public, Johnson & Johnson distributed warnings to hospitals and distributors and halted Tylenol production and advertising. 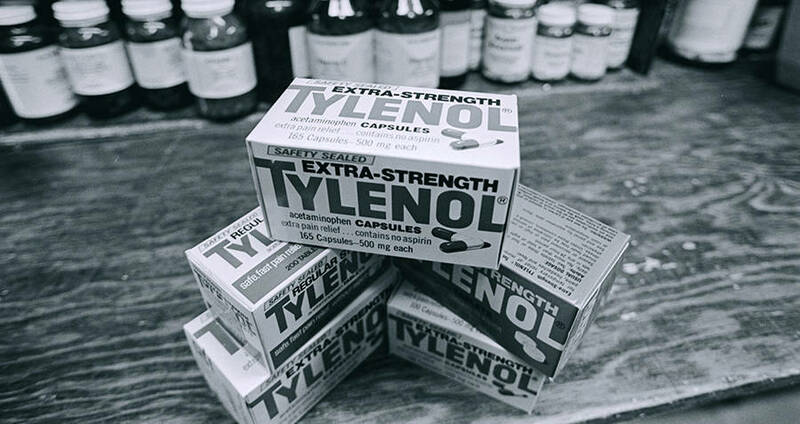 On October 5, 1982, it issued a nationwide recall of Tylenol products; an estimated 31 million bottles were in circulation, with a retail value of over US $100 million ($267 million in 2018). The company also advertised in the national media for individuals not to consume any of its products that contained acetaminophen after it was determined that only these capsules had been tampered with. Johnson & Johnson offered to exchange all Tylenol capsules already purchased by the public for solid tablets. A second man, Roger Arnold, was investigated and cleared of the killings. He had a nervous breakdown due to the media attention, which he blamed on Marty Sinclair, a bar owner. In the summer of 1983, Arnold shot and killed John Stanisha, whom he mistook for Sinclair. Stanisha was an unrelated man who did not know Arnold. [ Arnold was convicted in January 1984 and served 15 years of a 30-year sentence for second-degree murder. He died in June 2008. In early 1983, at the FBI’s request, Chicago Tribune columnist Bob Greene published the address and grave location of the first and youngest victim, Mary Kellerman. The story, written with the Kellerman family’s consent, was proposed by FBI criminal analyst John Douglas on the theory that the perpetrator might visit the house or graveside if he were made aware of their locations. Both sites were kept under 24-hour surveillance for several months, but the killer did not surface. Hundreds of copycat attacks involving Tylenol, other over-the-counter medications, and other products also took place around the United States immediately following the Chicago deaths. Three more deaths occurred in 1986 from tampered gelatin capsules. A woman died in Yonkers, New York, after ingesting “Extra-Strength Tylenol capsules laced with cyanide”. Excedrin capsules in Washington state were tampered with, resulting in the deaths of Susan Snow and Bruce Nickell from cyanide poisoning and the eventual arrest and conviction of Nickell’s wife, Stella, of crimes connected to both deaths. That same year, Procter & Gamble’s Encaprin was recalled after a spiking hoax in Chicago and Detroit that resulted in a precipitous sales drop and a withdrawal of the pain reliever from the market. Johnson & Johnson received positive coverage for its handling of the crisis; for example, an article in The Washington Post said, “Johnson & Johnson has effectively demonstrated how a major business ought to handle a disaster”. The article further stated that “this is no Three Mile Island accident in which the company’s response did more damage than the original incident”, and applauded the company for being honest with the public. [ In addition to issuing the recall, the company established relations with the Chicago Police Department, the FBI, and the Food and Drug Administration. This way it could have a part in searching for the person who laced the capsules and they could help prevent further tampering. [ While at the time of the scare the company’s market share collapsed from thirty-five percent to eight percent, it rebounded in less than a year, a move credited to the company’s prompt and aggressive reaction. In November, it reintroduced capsules but in a new, triple-sealed package, coupled with heavy price promotions and within several years, Tylenol had the highest market share for the over-the-counter analgesic in the U.S.
Additionally, the incident prompted the pharmaceutical industry to move away from capsules, which were easy to contaminate as a foreign substance could be placed inside without obvious signs of tampering. Within the year, the FDA introduced more stringent regulations to avoid product tampering. This led to the eventual replacement of the capsule with the solid “caplet”, a tablet made in the shape of a capsule, as a drug delivery form and with the addition of tamper-evident safety-seals to bottles of many sorts.